Poets have been seeing and commenting on this sort of thing for centuries, so there's not a lot of originality forthcoming in this one. But, sometimes, you really see something and that moment tempers a thought like it's a red-hot sword being plunged into the smith's water barrel and that thought becomes yours, bright, sharp and at the ready for the rest of your life, no matter how small or how great it might be. I'm not talking about a mere epiphany. Epiphanies can be forgotten about. This is something more permanent. For instance, a few days ago, my wife and I were sitting on the cool rocks by the ocean on a perfect spring day. And, of course, we watched the seagulls playing about the foam and walking on the tide-smoothed sand. 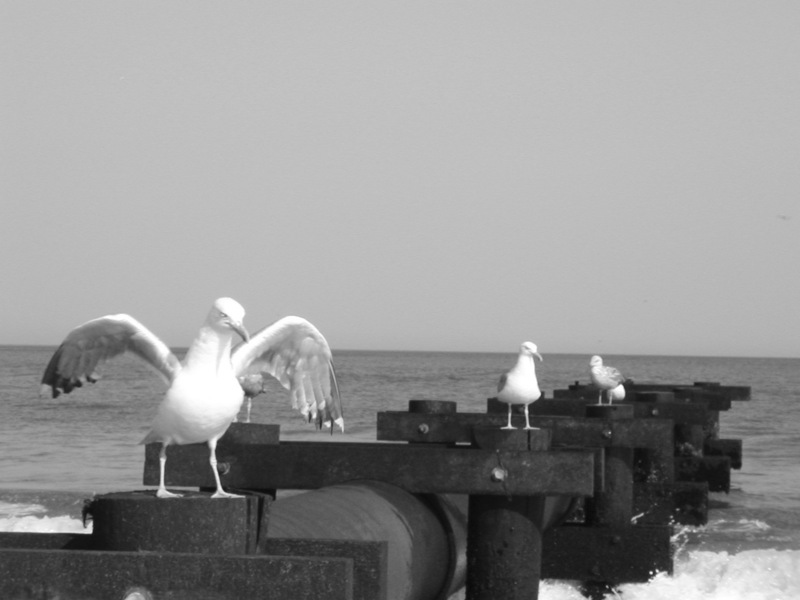 I uttered my usual joke when the seagulls called: "I don't see what's so funny . . ." and my wife, bless her soul, laughed at it yet again. Soon, though, I locked my eyes on one particular gull strutting around like a blustery playground bully, carrying a small mussel. He puffed up his chest when other gulls came around and he flapped a little and they left him alone. As he settled into his lunch, I watched, and it occurred to me how unbelievably goofy he looked with that head -- like the top of a bowling pin -- and those silly little black eyes and the ridiculous incongruity between the rotund body and the spindly legs bending backward as he made little delicate prints in the sand. But then, he took flight, his wings lifting him high enough to catch the updraft and then curving into two perfect arcs of heaven's engineering and he glided under the sun and above the spray, impossibly graceful -- transmuted by mere presence in his true element from a bumbling oaf into a majestic spirit of the sky. And when he called from up there, it was no longer a mockery of laughter but a melodic proclamation of truth cradled on he ocean's baritone harmony. That's all of us, I thought, as my red-hot idea plunged, hissing, into the waves around me to become forever part of my understanding. Nice! The next thought I had was...bumbling oaf and spirit of sky...it behooves us to embrace both states. A gull wouldn't have feet if he weren't also meant to land. "A gull wouldn't have feet if he weren't also meant to land."